☆ Advance Reservations Required? : Reservations via lottery are required for Opening week, Weekends & holidays at Ikebukuro & Nagoya locations ONLY. More details below! Hunter x Hunter (ハンター×ハンター) is a Japanese manga series by Yoshihiro Togashi! This popular franchise also has anime, game, and film adaptations. This collaboration will be held for a limited time between 1/17/19 - 2/26/29 with Animate Cafe at their Ikebukuro 3rd Shop, Nagoya 2nd shop, and Kobe Sannomiya locations! 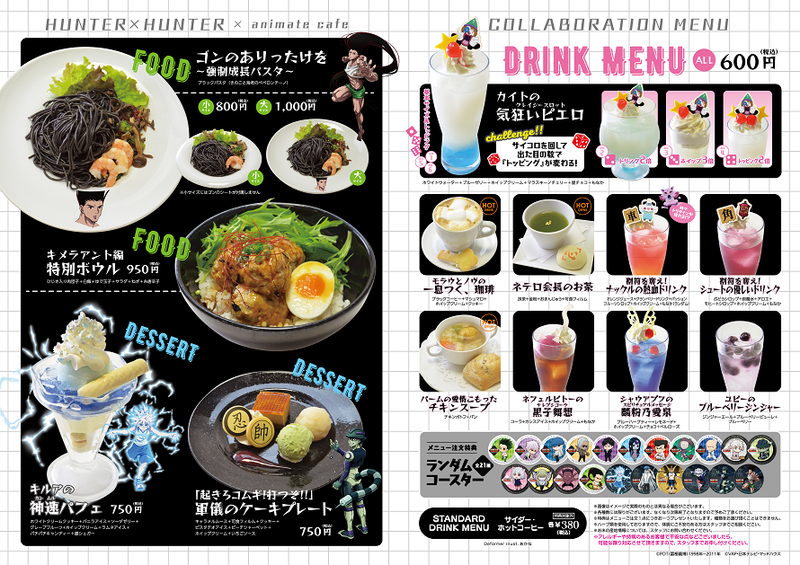 This will be the 4th collaboration between Animate Cafe and Hunter x Hunter! Due to popularity the Nagoya location was announced on 12/17/18! Translation of the campaign is coming soon! The Ikebukuro & Nagoya locations will use a lottery reservation system for opening week, weekends & holidays. Kobe Sannomiya Location + weekdays at Ikebukuro & Nagoya locations are free to visit without reservations. We highly recommend tourists/non-residents to visit either the Kobe location or visit during a weekday that does not require you to go through the lottery reservation process. Customers who order off of the collaboration food or drink menu will receive an original coaster (1 out of 21 designs) at random per order while supplies last. This collaboration will be held at 3 location(s) around Japan. Please be sure to verify the date, time, location, and reservation status of the café closest to you before visiting as these details may differ from location! *Please note there is more than one ‘Animate Cafe’ in Ikebukuro. Be sure to visit the correct location! *Please note there is more than one ‘Animate Cafe’ in Nagoya. Be sure to visit the correct location! Disclaimer: Dates, times, locations, café rules & other information involving limited time cafés and menu items are subject to change at anytime. Please carefully review the cafés website for the most up to date information before visiting! Dango News is not affiliated with or sponsored by this café.